I’ve my usual weekly update to do later tonight or tomorrow morning, but in the meantime a quick note on the new ComRes poll of marginal seats, which has tables here. My heart always sort of falls when I see a marginal seats poll, as I know how people will misinterpret it. Twitter inevitably sees lots of comments about how Labour has a great big lead in the marginals that count, or Labour might be neck-and-neck nationally but they have a big lead in the important marginals – seemingly oblivious to the fact that the topline results and what they mean depends entirely on which marginals you are polling. What could be a bad headline result for Labour in a batch of seats they only just missed out on in 2010 could be an excellent one in a batch of target seats they need for an overall majority. The crucial thing when looking at marginal polls is the swing from the last election, and how that compares to the swing implied by the national polls. So, using today’s ComRes poll as an example, here’s how you should interpret a poll of marginal constituencies. I expect this will covering old ground for many people, so I hope regular readers will forgive me stating the bleeding obvious in some cases! The first thing is to look at what the shares of the vote were in those seats at the previous election – without knowing that, any swing or change is meaningless. In the case of ComRes, their marginal seats polls cover the 40 most marginal seats with Labour and Conservative in first and second place. That consists of 25 Conservative seats and 15 Labour ones, with shares of the vote at the last election of CON 37%, LAB 37%, LDEM 18%, UKIP 3%. The next step is to compare the results of the previous election to what the poll shows. Topline figures in today’s ComRes poll, with changes from the election, are CON 31%(-6), LAB 40%(+3), LDEM 8%(-10), UKIP 15%(+12). From being equal at the last election, Labour now have a nine point lead – the equivalent of a 4.5 percent swing from Conservative to Labour (the swing is the relative change, divided by two). Now compare it to the national polls. Looking over the current UKPollingReport average it shows a two point Labour lead. Labour were seven points behind the Conservatives in 2010, so conveniently enough this is also a nine point relative change in the lead, and the equivalent of a 4.5 percent swing from Conservative to Labour. In other words, this poll doesn’t show Labour doing better or worse in the marginals, it shows the Con-Lab marginals behaving exactly like the national GB polls suggest they will. Of course, this is just a single poll of 1000 people anyway, so even if it did show a swing that was a point or two higher or lower in the marginals it wouldn’t be worth reading much into. It could just be sample variation. Looking back over other Ashcroft and ComRes polls in Con-Lab marginal seats we’ve had some showing the Conservatives doing slightly better in the marginals, some showing them exactly the same, some showing Labour doing slightly better. All in all it suggests the swing in Con-v-Lab marginals is very much in line with the swing in the national polls. And that’s to be expected. If history is any guide we might expect the Conservatives to do a little better as most of the battleground seats have new Conservative incumbents, but only by a very small amount – the reality is that Con-Lab marginals do tend to behave in pretty much the same way as the nation as a whole does. Why when we get a batch of marginals polling is it always 25 Tory seats 15 Labour seats etc…? Wouldn’t it be more instructive to poll Labour/Con/SNP’s top 50 targets seperately? Those are the ones ComRes have chosen to do. Rather than chop and change, they’ve set up a consistent block of marginal seats they keep going back to so they can look for changes. Is it true that when Americans talk about ‘middle class’ people they mean what we would call ‘working class’? I get most of my knowledge of the USA by watching The Simpsons, so am quite prepared to be wrong. If I’m right, it is something that could cause confusion when comparing social and political issues between the UK and US. Middle class in America means “Don’t live in a mansion and drive a Ferrari”. The only people you’d identify as working class would be those in very obviously working class professions like dockworkers, steelworkers or miners (who actually, thanks to high trade union membership in those industries, are often rather well paid). Interesting to see the Lib Dems hanging onto a rump of 8% even in seats where they stand no chance – that does not bode terribly well for them in their held seats if true. @ Anthony – I recall YouGov polling a big batch of marginals in 2010 (100 or so I believe) – was that just a one-off? Thanks. Another misconception cleared up. US usage of “middle class”. At various times, when over there, I’ve tried to explore this with various folk. The questioning often produces puzzlement because such terms never have a precise meaning, but are imbued with cultural references in that society which are difficult to translate to outsiders. The nearest I got was that it includes those with a “stake in society” – whether that be through property ownership (eg a house”) or a skilled trade etc – but excluding the “wealthy” – and definitely excluding landless labourers and unskilled workers. 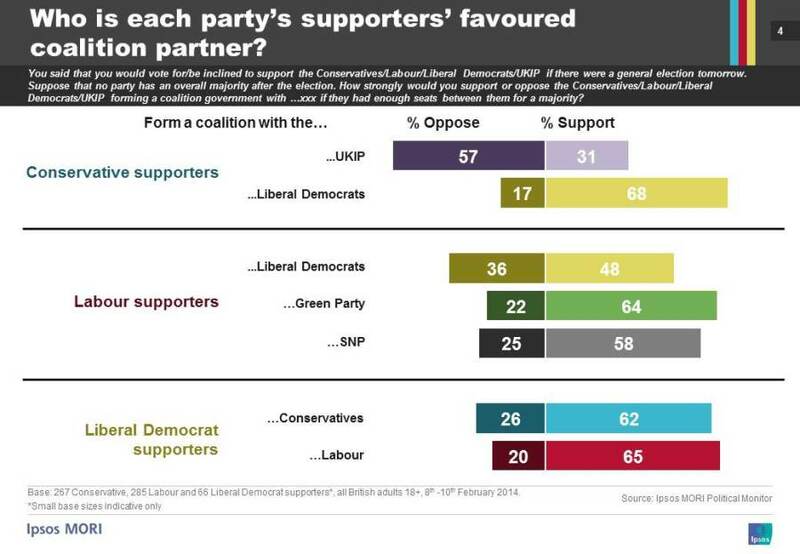 Labour voters prefer the SNP to the Lib Dems as coalition partners. This echoes something I’ve been saying for a while: most people only care about process when they don’t get the result they want. Many Labour voters are perfectly sanguine about an SNP coalition because they want the anti-austerity policies the SNP are likely to push for. So I think the concerns about the toxicity in England of relying on SNP support may be somewhat overblown. Labour don’t need to appeal to everyone, they just need to appeal to 35% of the electorate. And most of those voters will be happy to see Labour policies enacted by whatever means necessary. Paul Fussell (although it’s now a 30-year old book) clears it up quite well and rather humorously. He was a lecturer of English over there so he interpreted a lot of references for the UK. Thanks, that’s more in line with the impression I had, though as you imply these terms are very open to different interpretations. BTW, my understanding of lower middle class in England would be people in occupations such as shopkeepers, bank clerks, low-grade office workers etc and who were at least hoping to buy property one day. Some of these might well consider themselves working class of course, and I’m sure there will be as many definitions as there are posters here. There are many people in the north of England who would to vote for the SNP. As a Yorkshireman through and through, I feel I have much more in common with the Scotland and Wales than London and the Home Counties. I had just posted this response to your question on the last thread when this new one opened up. I see that otters have expressed their wiser analysis so I’ll stop after this. Spearmint answered your question better than I can. I would only add that “Middle Class” identification in the US (by people not analysts) is based on lifestyle and consumption, not income. Low prices and easy credit create lots of opportunities for people on lower incomes to identify themselves as middle class. I’m always taken by how little my US students know about real class inequality in their own country. Also I agree with Spearment that sociologists and political scientists looking at many questions still use ethnic demographics. And, of course, cross-breaks are important for pollsters. I was really just trying to convey that terms like WASP or Italian-American have given way to terms like White and Latino in political discourse and popular analysis of political outcomes. I’m surprised so few Labour supporters would oppose a coalition with the Greens. If you asked party members that number would be far higher – as would be the number of Tories opposing another Lib/Con pact. In Germany any skilled (certified) worker would have a higher social status than a clerical worker – the official terminology for the latter is improductive. The same is true for the Czech Republic. When I lived in the US they talked more about ‘white collar’ and ‘blue collar’ worker rather than middle class/ lower class if that helps. White collar seems to equate to middle class here, blue collar to working class. This discussion of class has made me wonder whether the old working-class Tories as satirised by the character Alf Garnett are where many UKIP voters have come from? That’s a tribalism issue, I think. Activists have to directly compete with the Greens for votes, whereas supporters see Caroline Lucas and think “Oh she seems nice” rather than “That should be our seat, dammit”. Plus supporters are less likely to encounter the online toxicity. Apologies if I’ve missed something, but surely the drop from 18% to 8% wouldn’t be LDEM 8%(-1), but LDEM 8% (-10)? I am a bit new to this though. The owl was returned to the wild and doing well. I assume you meant to say that the Lib Dem vote declined by 10% in the Lab/Con marginals not by 1%. That’s a 55.5% decline which is, if it were true, better than the 75% decline some people are talking about in Engalnd. What might be the “bleedin obvious” to you was not to me. Thank you for the explanation. It is much appreciated. Margaret Thatcher was lower middle class. Father was a shopkeeper. As PeteB said – they also include self-employed people, bank clerks and so on. This group is very anxious to get on in life and become proper middle class, with all the cultural accoutrements. The proper middle class – usually referred to as just The Middle Class – are professionals. Doctors, lawyers, accountants, academia. Ed Miliband comes from this group. They don’t like overt consumerism or conspicuous display of wealth (though they may be very comfortably off), they pride themselves on being low-key and values and culture are very important to them. Upper middle class people are usually just a notch away from the aristocracy. They are related in a loose way but somewhere along the line lost the titles because they are descended from second or third sons. David Cameron comes from this group. They miss being aristocrats and hold on for dear life to any connections they have and try to expand them. A very social group. Tony Blair comes from the aspirational working class. Father left school at 16 with no qualifications and then clawed his way up through hard work, night school and tried to do the very best for his boy. This group blings it for all they are worth once they’ve made it and sometimes before they’ve made it. They love conspicuous consumption – think Cherie going a bit mad when she’s told she can have freebies in a shop. This is also the largest group in the country and part of Blair’s success was based on them instinctively recognising him as one of their own on a gut level. His era with it’s low unemployment and easy access to things, was the closest they’ve got to realising all their dreams. As a non party member in Scotland I’d agree with your analysis. Labour activists / Councillors of my acquaintance have such a long standing and deep seated antipathy for the SNP they find it difficult to believe voters have switched. But when you point out how (outside the constitutional question) the policy differences between LiS and SNP are relatively minor so it’s not a huge leap for actual voters, especially those who agree with the SNP on the constitution. The good news for LiS is that if the constitution were relatively settled in a form most people agreed with (Devo Max + or some such) these voters would be relatively amenable to being won back. Don’t see a switch back until a new settlement (beyond Smith) is agreed. ComRes poll of marginals shows Con -6 Ukip +12 so does this equate to “vote Ukip get EM” , or is this too simple? Roland – I was thinking specifically of explaining was swing was, which I’m sure most regular readers will know, but for casual observers of politics may be a mystery. As you’ll imagine, I pick up huge numbers of non-regular readers in the run up to elections, so I expect I’ll be including lots of explanations that long time readers will already know about. Tony Blairs dad was a lecturer in law who was wealthy enough to send his sons to one of scotlands top private schools. His background is miles away from from being “aspirational working class”. Senior professional class more like. Not sure Thatchers background is “lower middle class” either – her dad owned two grocery stores – he was a JP and president of the board of trade – in other words prominent and well connected local business man. I was specifically referring to “most voters who were potential Labour -> SNP defectors”, who I think you’d accept have different priorities than the population as a whole. Being done fairly or unfairly? Too deep, too shallow or at about the right level? So even among the population as a whole- and this in a poll with a Conservative lead!- the balance of opinion is slightly towards less austerity, and strongly towards rebalancing the cuts in a fairer way (whatever that means, but presumably towards the rich rather than the poor). In Britain class is where you come from not where you end up! Blair’s dad was a working class Glaswegian who left school at 16, spent the 1930’s unemployed and flirting with communism, and then got it together later in life by educating himself at night school. You don’t change who you are just because you figure things out late in life. And Thatcher’s background is definitely lower middle class. Owning two corner shops does not make you full middle class even if you do get elected to the board of trade. It basically equates to “what your parents do for a living”. That’s why the achievement of someone from the lower classes, or the tribulations of someone from the upper classes, don’t really affect their own class. If you’re born in a council house and go to a comprehensive, you don’t suddenly become middle class just because you excel at university and end up in a top job. But you bequeath middle-class-ness to your kids. And a middle class girl who gets mixed up with drugs, drops out of school, gets involved in crime and winds up in a council flat with four kids by three different drug-dealer fathers stays a middle-class girl. But her kids will be part of the underclass (I have quite a specific example of this in my mind). The reason I said that I didn’t fully understand the English term “lower middle class” is that it is an English, not a British term. For all I know, it could just be a southern English term. Yes, I should have said English rather than British. I’ve been informed by a Welsh friend that the English are the only ones who base class on culture rather than income. Relating it all back to politics, part of Ed Miliband’s problem is that the professional middle classes he represents are a small group. Cameron represents an even smaller group. There arn’t any lower middle class or aspirational working class leaders at the moment who instinctively get how those groups think because they belong to them.